Compared to our certified modular homes – our primitive cabins are simple and warm, and our prefab vacation homes are built with the same high standards and quality of our homes. With our recreational cabins we don’t have to build them to the same engineered standards as our homes, so we can pass those savings onto you! 'Recreational Cabin' or 'Certified Home'? What is the difference?  Zook Cabins recreational log cabins are typically used for hunting camps, weekend retreats, a simple personal getaway cabin, etc. and are not primary residences. Some locations have code exemptions for these use types. For example: Pennsylvania allows you to sign a form saying you will not use the cabin for your primary residence and it exempts you from all residential building codes. This form can be found here This is a perfect fit for that recreational cabin that you are using only a few times in the winter and you do not want to spend all the extra money to insulate it to the latest residential requirements. It allows you to model your cabin as you like without working against minimum room sizes, bathroom clearances, heating system limitations, etc. However, if you plan to retire in this cabin someday, or sell your prefab vacation home as a residence — go ‘Certified Home’. Also be aware that not all states allow this exemption. 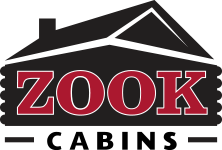 Zook Cabins certified modular log homes are built to the same codes as if they were built on-site. Each home includes a specific detailed drawing set to simplify your permit process, and each home is inspected in our facility to ensure complete code compliance. The exterior walls are or 2×6 construction (versus 2×4 for Recreational Cabins) and the insulation values are higher in the floor, walls and ceiling. We supply all the tools and knowledge needed to build a home to meet or exceed all the latest residential codes. 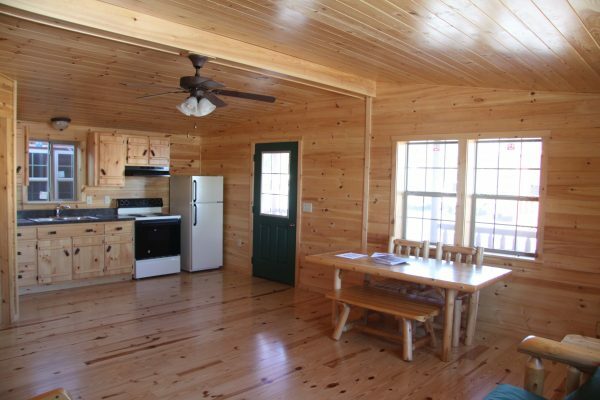 Build your own cabin plans with Zook Cabins! I live in the Adirondack model with my two children and it’s wonderful. We put ours on a cinder block foundation with a crawl space. For 3 days with had a crew of really nice Amish guys putting it together. They assemble the roof on-site, and put in the loft railings and lighting fixtures, etc. It was amazing to watch. I opted to skip a built in kitchen because of weird county regulations, and instead use a convection oven, electric hob and an enormous commercial sink. The Adirondack model comes with two lofts- one half the sf of the footprint, plus another much smaller one over the porch- in addition to a decent sized bedroom.